← What Will We Do After Work? We don’t always have at hand the words we need most. A lot of people, facing this difficulty, chose a word with meanings close to what they need and call it good enough. People who are more confident in their acquaintance with their language are more likely to feel vaguely affronted. There should be a word for that. There really should. Why isn’t there? At that point, some of us just make up whatever words we need and launch them on their careers. These careers are inevitably short and the deaths of these new words mostly unlamented, but they do meet the short-term interest of the person who fabricated them and ordinarily, that’s value enough. You know one of these new words is coming, right? Everyone knows that for every public policy adopted, there are winners and losers. The winners are called “beneficiaries;” sometimes thoughtfully, but more often not. In common unthoughtful use, someone who is affected by a policy is called a “beneficiary.” But what if the effect on that person is disastrously bad. Negative beneficiary? Too clunky. So I made up, for use in my public policy classes, “maleficiary.” Because bene- is “good” and mal- is “bad,” I figured that the meaning would be easily understood and it was—for the purposes of the class. This brings us to skeptificate. As you see, this is a noun. I have a skeptificate in the proper use of words. You’ll have to admit it makes perfect sense. A lot of people have certificates these days. The effect of a certificate is certus = “certain” plus facere = “to make.” I might or might not have the relevant skills—how is one to know?—but if I have a certificate, it makes you more certain that I have those skills. Why, otherwise, would anyone have issued me a certificate under their own name? A skeptic is, according to the etymology of the word, supposed to be a “thoughtful person.” We get it from the Greek skeptesthai, = “to reflect, look, or view.” It is related to a number of more familiar –scope words that come to us from Latin. Skeptics, however, tended to be thoughtful about matters other people took for granted, so the word began a slow evolutionary drift in the direction of “doubt” or “challenge” and it has had this meaning since early in the 17th Century. How do I know all this? Well, I read a little article about this word in the online etymology dictionary, which I heartily recommend. The article on skeptical was written by Doug Harper, whose learning I have every reason to trust. Do you know why? Yes. Because Doug Harper has certificates from places I have heard of and these certificates make me more certain that his work is trustworthy. But what if Doug Harper came to me with a document from the Academy of Peace, Justice, and Love (APJL)? This academy vouches for Doug Harper, but no one vouches for APJL. The document Mr. Harper brings to me does not, in fact, make me more certain. It makes me more doubtful. I am less likely to trust him on this matter than I was before he showed me his little piece of paper. His piece of paper says CREDENTIAL at the top, but it does not make me more certain. Papers like these should be called something else and I think they should be called SKEPTENTIALS because their effect is to make one less certain; more likely to doubt and challenge. 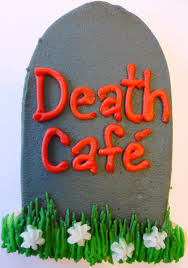 That brings me to this morning’s article in the New York Times, which describes the new wave of interest in “Death Cafes.” A bunch of people get together to talk about death in a philosophical way. That sounded pretty good to me. I’m interested in death in a philosophical way, so I looked to see whether there was such a gathering in Portland, Oregon. We really are that kind of town, so I thought the chances were pretty good. I don’t know anything about CFI either and what follows is really only a meditation on my own prejudices. I, personally, am extremely wary of a “Celebrant Institute.” It is the support of such programs that produces documents affirming that Holly Pruett is a competent celebrant and I have no reason to think she is not. But the paper issued to her by CFI does not function to “make me more certain.” It functions to make me less certain. It makes me more likely to doubt and challenge. 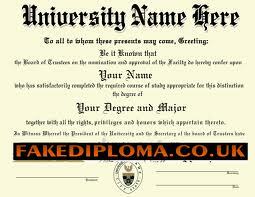 It is, in other words, not a “certificate” but a “skeptificate.” For me. Modernized professions also piece us out in time. Service professionals now assure us that we live through a set of needs defined by age. Professionals have “found” seven life crises (formerly known as the seven ages of man) from infancy to death, each requiring its helping professional. Elizabeth Kǜbler-Ross has advanced the process by giving us five phases of death. Her work ensures a new set of helpers for stage one of dying, stage two of dying, and so on. Following these dying therapists will be research professionals attempting to decide why some people skip, say, stage two or three of dying. This paragraph moves from Shakespeare’s “seven ages of man” to the “seven life crises.” Crises are occasions for judgment, with “ages” are not. The work of Elizabeth Kübler-Ross “ensures” (that’s McKnight’s word) a new set of helpers for each stage of dying. But it turns out that not everyone seems to go through all the stages (apologies to Elizabeth Kübler-Ross, who did not argue that everyone should go through all the stages or even that the stages had an invariant order). That means that we will need research professionals who will study why some people “skip” one or more stages. These “skippers” are, apparently, not doing it right and will need professional assistance. 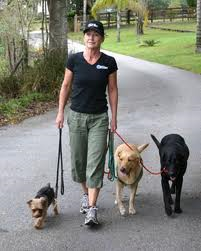 I found this picture by googling the Professional Dog Walkers Association. I had read that passage from McKnight just before reading about the Death Cafes, which was just before I wondered whether we had one in Portland, which is what brought me to Holly Pruett, who brought me to the Celebrant Foundation and Institute. Had that line of thought gone in a different direction, it would not have produced this post. The best encapsulation of this dilemma I know of comes from Crocodile Dundee. Mick Dundee is from Australia’s Outback and his new girlfriend is a New York City journalist. She tells Mick that a friend of hers is seeing a psychiatrist. There’s nothing wrong with the friend; it’s just, you know, to have someone to talk to. Dundee is incredulous. “Doesn’t she have any mates,” he asks? Apparently not. We have chosen, as McKnight’s subtitle puts it: “counterfeits for community” rather than “community itself.” I am sure we feel safer in a community we have hired for the purpose, but I am not sure that such a “community” sustains us. Credentials, by the way, are scarcely any better. Credentials—credo, “I believe”—are supposed to give you a reason to believe in the competence of the person. On this foundation, a certificate is just further confirmation. The Greek krisis includes, among its principal meanings, “to decide,” and this remains true even though krisis has also given us critic, which has flowed, over time, in the same direction as skeptic. This entry was posted in Paying Attention, Words. Bookmark the permalink.